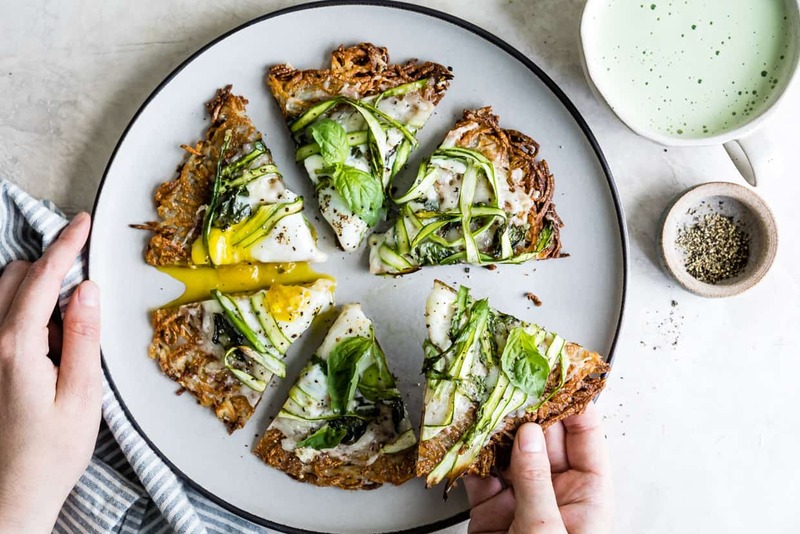 I bring you hash brown breakfast pizza – melty cheese between layers of crispy hash browns topped with more cheese, shaved asparagus, basil, and the perfect runny egg. 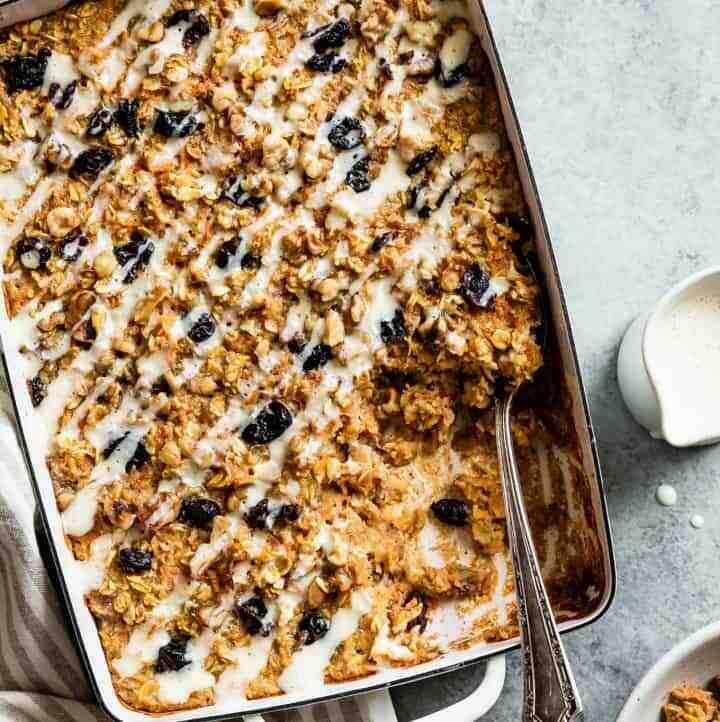 Reward yourself with the most delicious breakfast or brunch to share with someone you love or eat entirely by yourself! We keep a relatively healthy pantry and fridge – mostly produce, grains, a little organic meat/fish, and lots of cheese (like I’m talking an entire crisper worth of cheese…and then some more in the garage fridge). When we buy processed foods like crackers or chips, they’re primarily made from ingredients we can pronounce and trust. And because we trust what we buy, I also believe in eating what my body craves without feeling an ounce of guilt. Homemade dessert? Check. Cheese? Check. Cheesy hash brown breakfast pizza covered in more cheese? Check. (Full disclosure: This is just my personal approach to food – I am no dietician). For Mother’s Day, I’m partnering with Roth Cheese to appreciate the ways I reward myself for the everyday simple things that feel like great accomplishments. 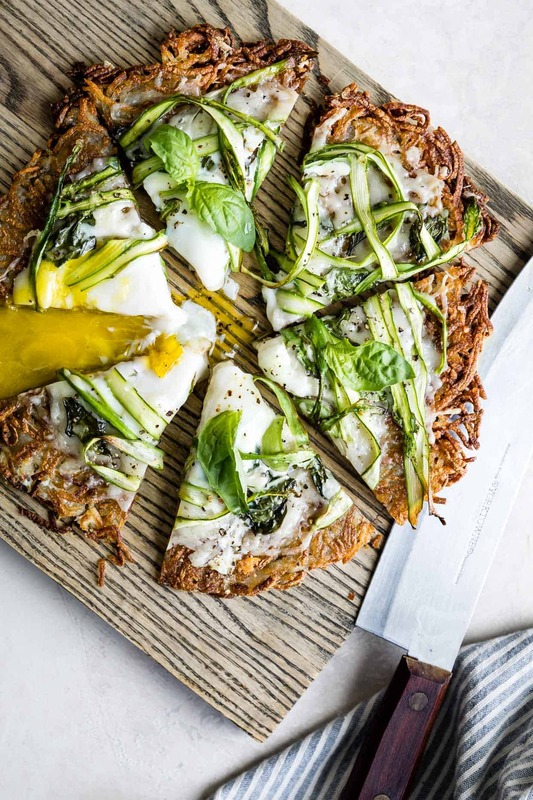 Today that looks like this cheesy hash brown breakfast pizza with shaved asparagus, basil, and a runny egg. I can always find a reason to reward myself for the small things. I managed to cook a meal my toddler will actually eat while she also tugged at my legs the entire time yelling “UPPIE!! !” Go me! We washed and folded and put away all the laundry before it was time to do laundry again a week later. Heck yeah! My toddler said please, thank you, and sorry at all the right times without any prompting. We taught her that – she’s learning! You feel me? Whatever the reason, there’s always cause for celebrating even when you feel like you just barely got through today. Moms know as well as the next person, sometimes that in itself is a great accomplishment. For all these reasons, I don’t let myself feel consumed by feelings of guilt around what I should or shouldn’t be eating and how much – as long as I’m actually listening to my body and how the food I choose makes me feel. For some people they may think of cheese as a reward to be eaten only on special occasions. I am not one of those people. I eat as much cheese as I want (a lot), balanced by veggies and grains. Instead, the reward for me is allowing myself to take the time on weekends to cook something for myself – which usually almost always definitely involves cheese. 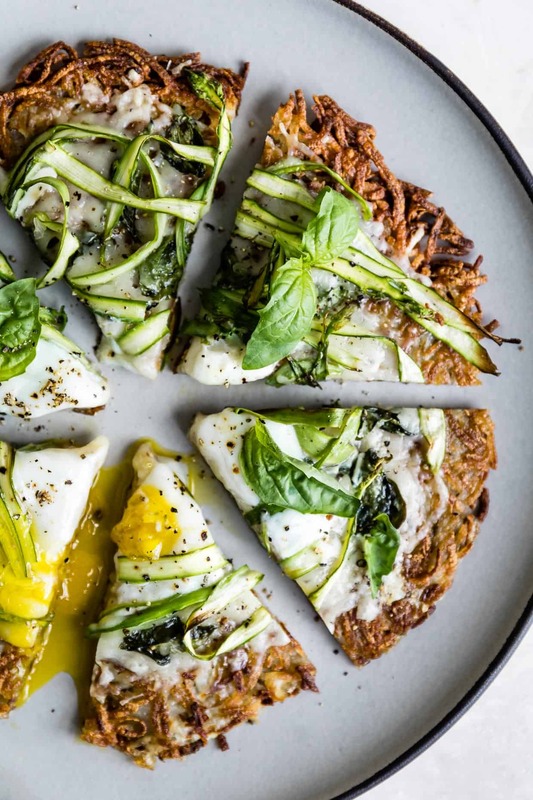 When I think of what I want to eat for Mother’s Day brunch, this hash brown breakfast pizza is it. 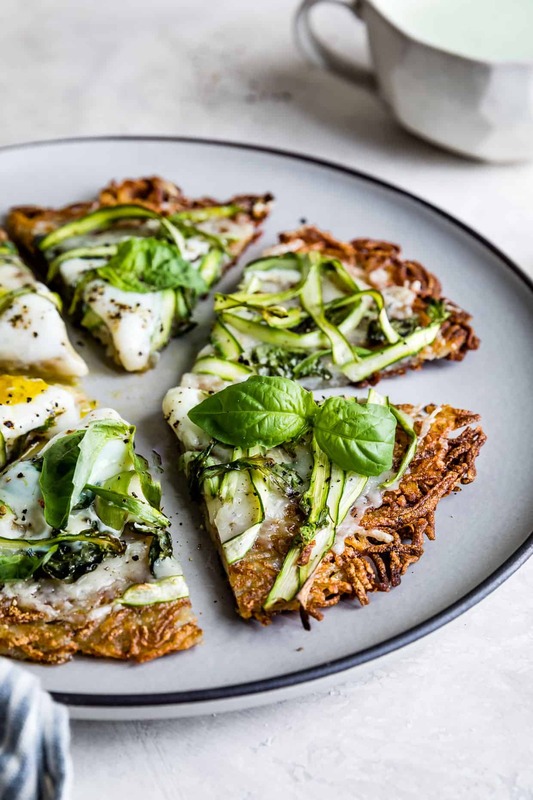 It’s a springtime breakfast pizza with a golden brown hash brown crust. 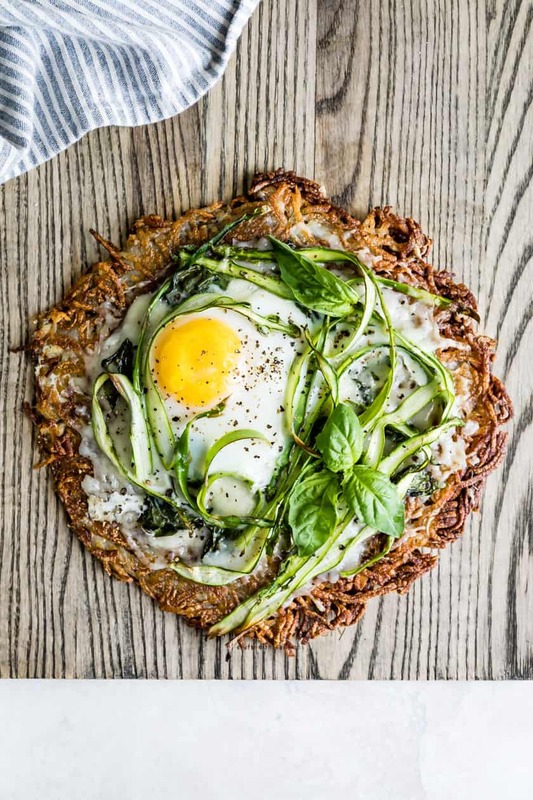 Melted cheese between two layers of crispy hash browns with more cheese melted on top, and bright spring basil, shaved asparagus, and a perfect runny egg. When you cut into it, egg yolk spills out as sauce to sop up with every crispy bite. 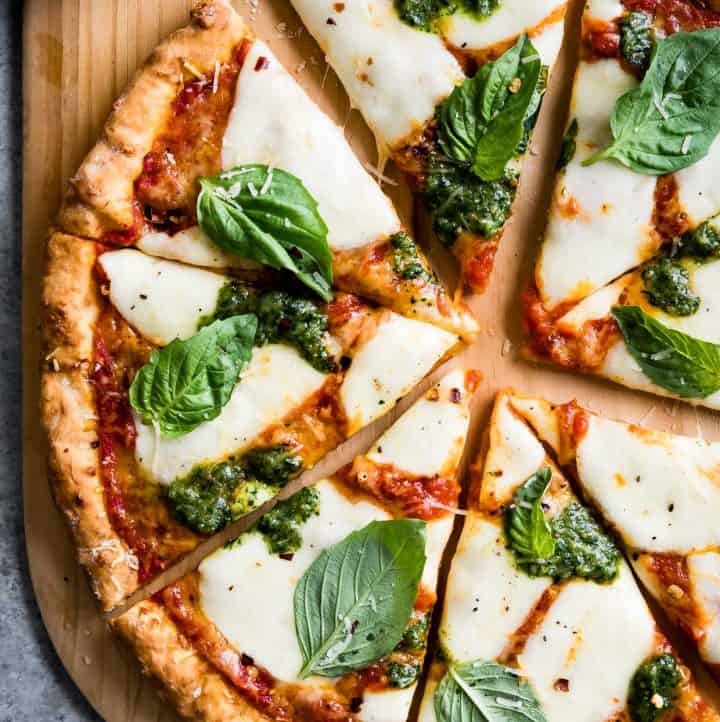 Roth’s grand cru cheese is robust enough to stand out against the crispy fried potato crust, but settles in to meld the flavors of the whole pizza together without overpowering. 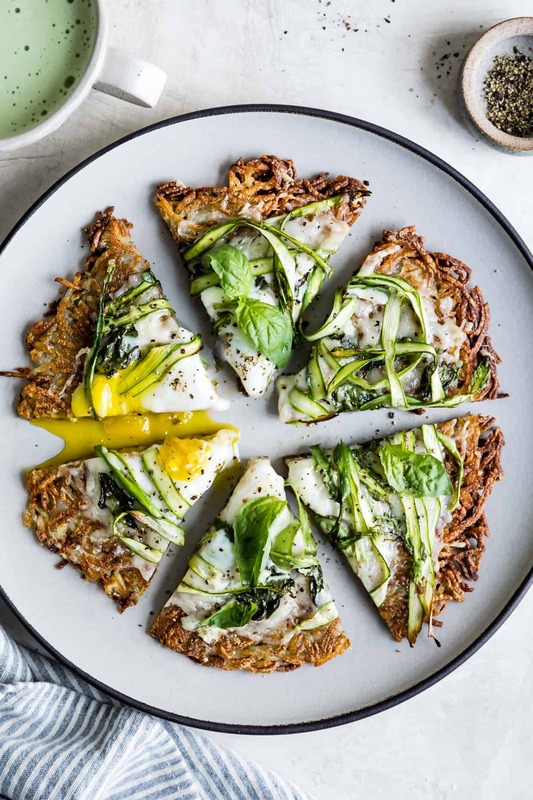 This hash brown breakfast pizza is a flavorful brunch treat that feels special enough for Mother’s Day while still only taking about 20 minutes away from reading the same “you’re going to be a big sister” book to my toddler for the 10th time that morning. To all the mother’s out there who can imagine exactly what this feels like, you deserve to spend some time rewarding yourself with a special brunch made with your favorite cheese. And to all those of you who aren’t parents, whatever your reason for celebrating life’s simple accomplishments, you deserve it too! 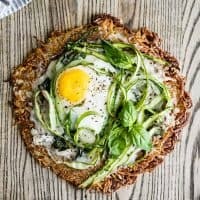 I bring you hash brown breakfast pizza - melty cheese between layers of crispy hash browns topped with more cheese, shaved asparagus, basil, and the perfect runny egg. 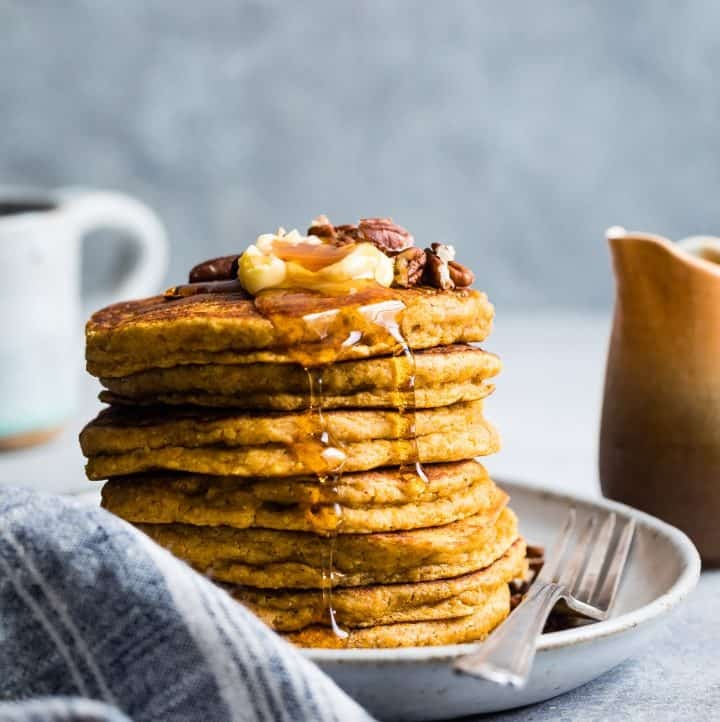 Reward yourself with the most delicious breakfast or brunch to share with someone you love or eat entirely by yourself! Using a clean kitchen towel or a cheese cloth, squeeze all the moisture out of the grated potatoes as firmly as possible. 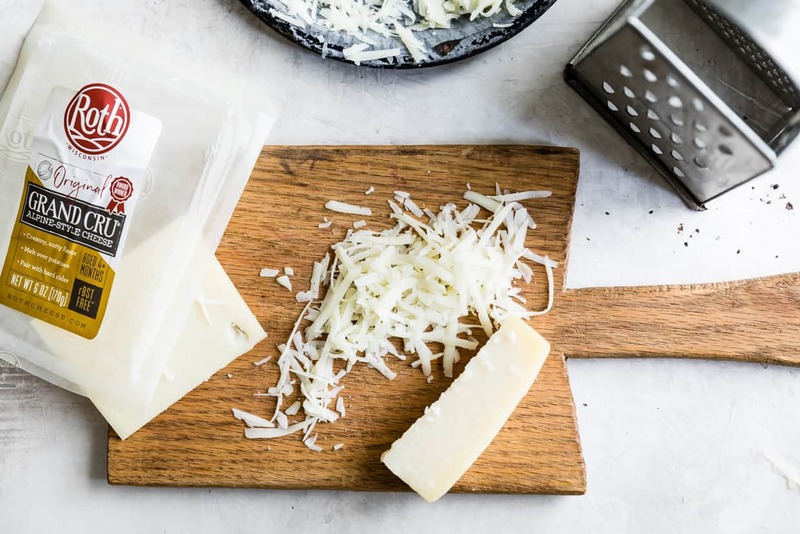 I usually squeeze out with a cheese cloth, then spread the grated potatoes in a kitchen towel and roll it up to dry them as much as possible (the key to getting them crispy!). Toss the grated potatoes salt and lay them on a plate lined with two paper towels. Microwave the potatoes for 2 minutes. This step will par-cook the potatoes so that your hash brown will be cooked in the center as soon as it gets golden brown and crispy. Heat 2 tablespoons vegetable oil in a large nonstick skillet over medium heat. 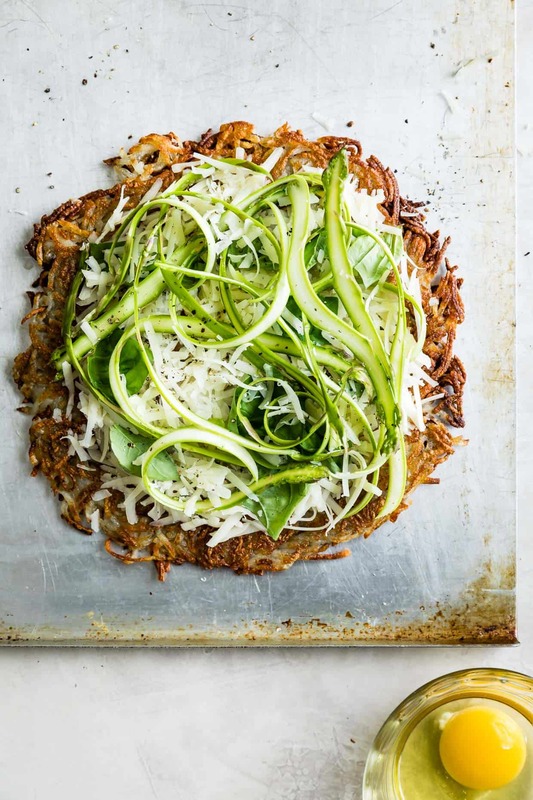 A non-stick is best for evenly browned hash browns, but you can also use a cast-iron in a pinch. When oil is hot, add half of the grated potatoes. Use a spatula to spread them out into an even 8-inch round layer. Sprinkle 1/4 cup of shredded cheese over the center of the potatoes, leaving about 1-inch border. Add remaining grated potatoes in an even layer. Use a spatula to press the hash brown flat. Cook, undisturbed, until lightly golden brown and crisp, about 3-4 minutes (it will brown and crisp up more as it bakes with the toppings). 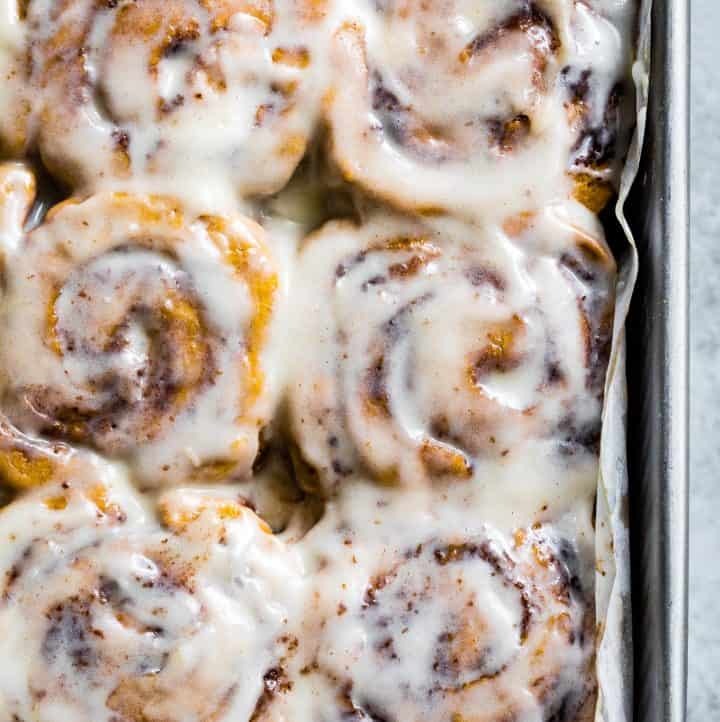 Turn off the heat and place a baking sheet over the top of the pan. Use oven mitts to invert the skillet so the hash brown is brown side up on the baking sheet. Return the skillet to medium heat and add 1 tablespoon of vegetable oil. Gently slide the hash brown into the skillet, brown side up. Cook until lightly golden brown and crisp, 3-4 minutes. Remove the skillet from heat and use a large spatula to transfer the hash browns to a parchment-lined baking sheet. Sprinkle with remaining cheese, adding more as desired. Toss the asparagus ribbons in 1/4 teaspoon olive oil just to moisten. 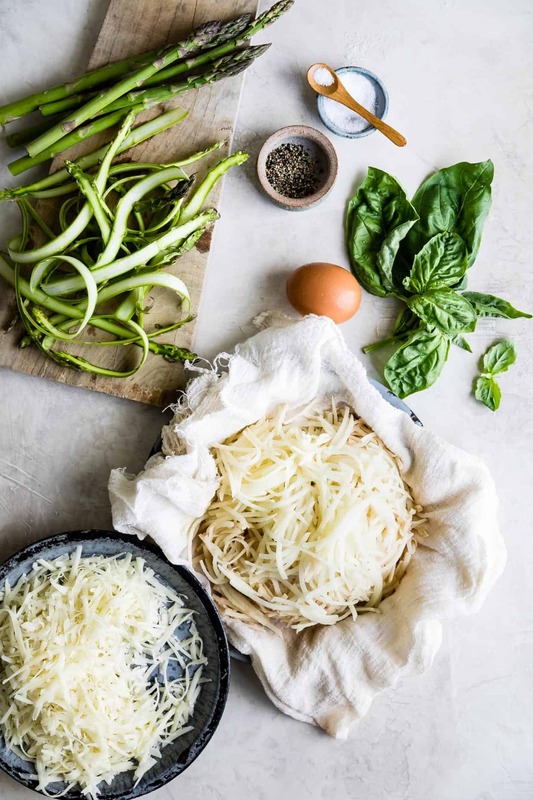 Arrange the asparagus ribbons and torn basil over the top, leaving a little nest space for the egg. Sprinkle with a few cracks of freshly ground pepper. Place the pizza on the middle oven rack and bake for 1 minute until the cheese begins to melt. Crack the egg into a small bowl. Slide the oven rack out and carefully pour the egg into the nest on the pizza. Gently slide the oven rack back into the oven and bake just until the egg whites set but the yolk is still runny, 6-7 minutes. If you notice your hash browns getting too dark for your liking before your egg is set, you can cover the edge with a little bit of foil to keep them from getting too dark. Sprinkle with more pepper, garnish with basil as desired, and eat! *There's a lot of debate over whether or not you should rinse your grated potatoes before making crispy hash browns, with most people in the yes camp. However, Serious Eats did a hash brown comparison test of ll the different variations and they found that the ones that were not rinsed held together better for a crispy crust! This rings true to the hash browns I've made in the past that are more loose. So for this recipe, I don't rinse the potatoes since we're using the hash brown as a pizza crust. Do you ever work out the calories to help those of us counting them. It would be so great with thanks. 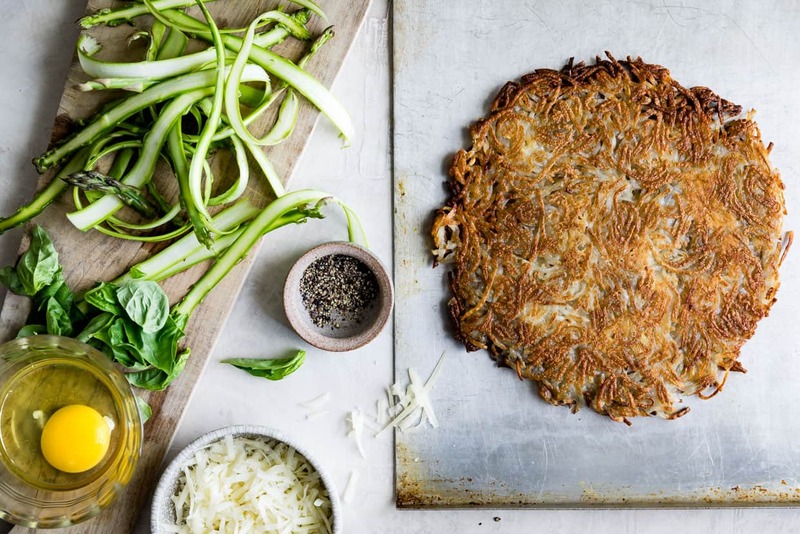 Hash brown pizza is the stuff dreams are made of. Whoa girl. This looks too good to be true. But one question: how can you prevent a fight over who gets the runny yolk slice?!! Obviously I’m eating this all by myself in peace and not sharing. Hehe. Awwww I can just see Zoella reading to her cats :) that is so cute. I know exactly the feeling you’re talking about! Happy Mother’s Day Sarah! PS this pizza looks legiiiiiit. I don’t think I’ve ever been so excited about breakfast! This is awesome. Happy Mother’s Day, Sarah! This looks delicious! I make something similar but on pita bread. OMG!! The potato breakfast pizza is making my mouth water! I am going to make that my weekend try this Saturday. Love your website Sarah. It’s inspiring and delightful.